The most gifted female athlete of the 20th century, and perhaps of all time, was a Texas woman called Babe. 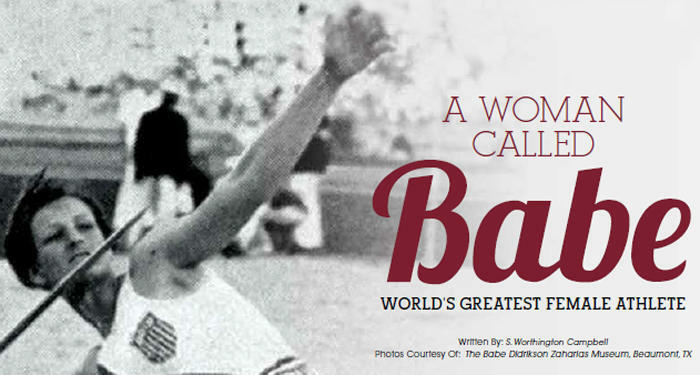 Mildred Ella “Babe” Didrikson Zaharias became a U.S. sensation and an international phenomenon after she won three medals in track and field at the 1932 Olympics. Babe excelled at every sport she tried, and by the 1940s, was the greatest woman golfer that had ever played the game. She was a woman ahead of her time and although she had critics who accused her of being pushy, coarse, and unfeminine, she began to change society’s idea of just what a woman could actually do. One of seven children, Babe was born on June 26, 1911 in Port Arthur, Texas to Norwegian immigrants – Hannah and Ole Didrikson. Her family moved inland to Beaumont when she was four years old, after a hurricane hit the coast and destroyed their home. It is hard to say exactly what spurred Babe’s early interest in athletics, but one clue might be the fact that Babe’s father was an early proponent of physical fitness and conditioning and built his own weight lifting gear from a broomstick and some flat irons. As a child Babe was a raucous ball of energy who preferred playing with boys. She gained her nickname, some say, after a particularly stellar sandlot baseball game where she hit five home runs, which the boys compared to the heroic feats of Babe Ruth. By the time she was a teenager, Babe said her life’s goal was to be “the greatest athlete that ever lived.” At Beaumont High School, when she was 15 years old, Babe was already a star player in tennis, swimming, baseball, volleyball, and basketball. It was her prowess as a basketball forward however, that gave her the opportunity to shine on a larger stage.